Make your online reservation, travel by bus has never been so easy! Discover bus stops of the national line Montesarchio – Riccione. Compare prices, timetables and plan your trip on online ticketing system LinkAvel. 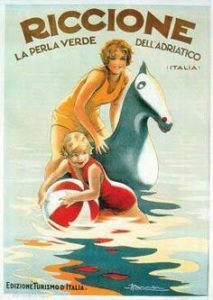 Riviera Romagnola is waiting for you! 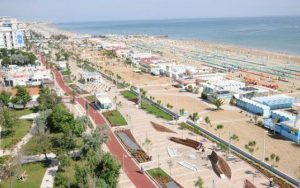 Riccione is a town on the Adriatic coast, much loved by young and young at heart for the countless entertainment possibilities available, in summer as in winter. In this small city, also called the Green Pearl of Adriatic, you can find numerous places of interest including the Villa Mussolini, often hosts exhibitions and must-see events, as well as the famous Castle Agolanti. In Viale Dante and Viale Ceccarini, you will have the opportunity to shop in designer shops and then have a little coffee break or an aperitif at one of the many bars in the area, often frequented by celebrities from the world of sport and entertainment. Among the amusement parks, for over twenty years the Riccione Aquafan is the most famous water theme park in Europe. It covers a hilly area of about 90 thousand square kilometers, characterized by rich and shady green areas, where fun is guaranteed. Enthusiasm and strong emotions will remain in the hearts of visitors who can have fun with slides, pools, water features of all shapes and kinds. A must is the Kamikaze slides attractions, the Tobogas, the Extreme Speedriul River, the River Run, the Surfin’hill and the Twiste Slow River. At the theme park Oltremare you can explore the sea, the marine habitat especially dolphins. The visit includes the attraction Laguna dei Delfini: dolphins with jumps, splashing and evolutions involve tourists in the real world of the sea. The spas are extended approximately 40 thousand square meters in a beautiful park and offer different types of wellness programs in waters, healthy and relaxing: sulfur, salt bromine, iodine and magnesium. Here you have different types of spa treatments: mud and therapeutic baths, arthritic and rheumatic baths, massages, pools with different temperatures and hydro.